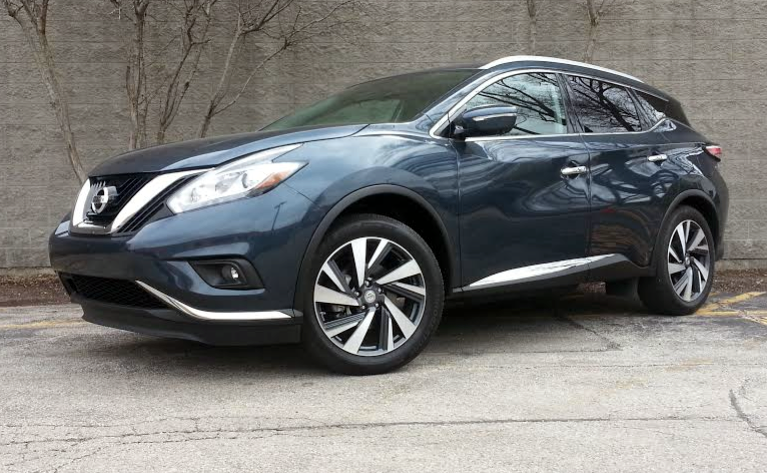 Consumer Guide’s 2015 Nissan Murano arrived in top-line Platinum AWD trim. Including the destination charge, our test crossover came to $43,995. If you’re shopping midsize sport-utility vehicles, you’ll probably like the redone-for-2015 Nissan Murano. That’s because it goes out of its way to not be unlikable. There’s no noisy, rough, or raucous engine—just one with enough power to get around without complication. There’s no maddening tap/twist/toggle central control for infotainment systems—just an easy-to-follow touchscreen and clearly marked buttons along the sides that take you right to what you want to see or hear. Unless the new styling doesn’t tickle your fancy, there’s nothing here that should offend anyone’s senses. The Platinum trim level brings with it additional exterior bright trim, and 20-inch wheels. Of course, the lack of challenge, the absence of edgy might set some people off. On the whole, the 2015 Murano in high-end Platinum trim that Consumer Guide® tested is a very nice vehicle—and in some circles, “very nice” amounts to damning with faint praise. Murano’s cabin feels upscale. Note the use of unconventional titanium-look trim where wood elements might usually be found. Among its standard equipment, the Murano Platinum counts a 3.5-liter V6 engine; continuously variable transmission (CVT); stability and traction control systems; hill-start assist; blind-spot warning; rear cross-traffic alert; Around View Monitor 360-degree exterior camera; leather-upholstered “zero-gravity” seats; an 8-way power driver’s seat with power lumbar adjustment; heated front seats; 60/40 folding rear seats with power return; leather-wrapped steering wheel and shift knob; memory settings for the driver’s seat, mirrors, and power tilt/telescoping steering wheel; 9-speaker AM/FM/CD/MP3/WMA Bose audio system; ambient interior lighting; cruise control; NissanConnect infotainment with navigation and mobile-app suite; 8-inch touchscreen display; satellite radio and traffic information; Bluetooth connectivity; 7-inch vehicle-information display; dual-zone automatic climate control; push-button and remote starting; fog lights; heated exterior mirrors with built-in LED turn signals; silver roof rails; and a power liftgate. Items that set the Platinum apart from the SL trim level just below it are machined 20-inch alloy wheels, heated rear seats and cooled front seats, a heated steering wheel, and LED headlights. With all-wheel drive, as on CG’s test vehicle, a 2015 Murano Platinum starts at $40,600—$1600 more than a front-wheel-drive job. The one we drove was outfitted with the optional Technology Package (panoramic moonroof, “intelligent” cruise control, forward-collision warning, and forward-emergency braking) plus accessory floor mats and a cargo-floor protector, all of which pushed the total as-delivered price to $43,955. 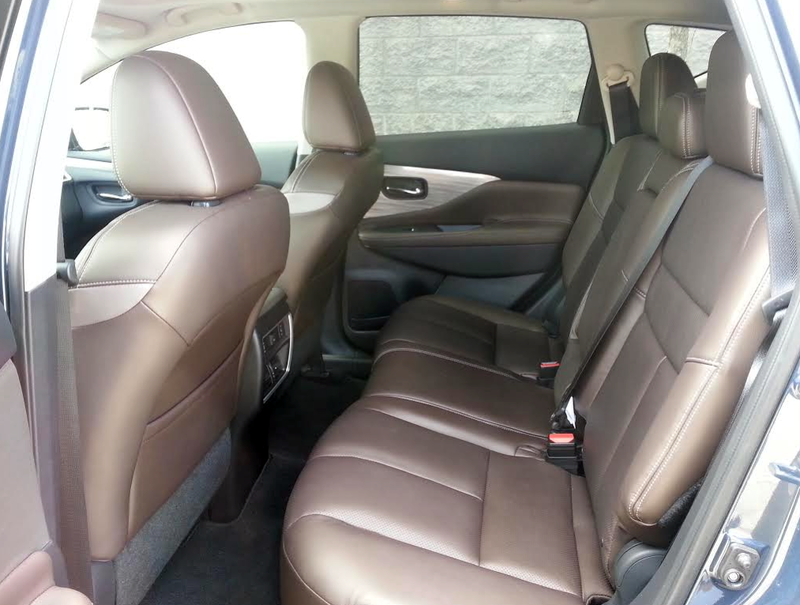 The Murano provides ample space for four adults to travel in comfort. A third rear-seat passenger will fit reasonably well, should the need arise. Generating 260 horsepower at 6000 rpm and 240 lb-ft of torque at 4400, the V6 provides fairly snappy acceleration—even hooked to a CVT, which isn’t always the best thing for good go. The cabin is quiet, with the noises of the engine and passing traffic so well tamped down that you might hear some tire noise that would otherwise escape your attention. Controls are easy to read and use. Tachometer and speedometer dials bookend the large electronic vehicle-info readout. As noted the audio system is fairly easy to program and use, and climate controls use temperature-setting dials and a few clearly marked function buttons. Rear-seat passengers have their own seat-heater switches and a USB port built into the back of the console. Interior storage is very good overall. The glove box is a little low in the dash but its pleasant secret is that it is large and deep. The console box under a wide, padded lid is huge, too, and has an adjustable tray. (Media-device inputs reside in their own little covered well in the console, so they don’t rob space from the console cubby.) Two open cup holders are in the console as well. Small front door pockets include bottle holders; rear doors have smaller pockets. Second-row storage also includes pouches on the backs of the front seats, and a pull-down center arm rest with 2 cup holders. The ample and convenient rear cargo area loads at bumper height onto a flat floor. Space is good to start with and gets even better when the rear seats fold flat with an uninterrupted surface. Seats can be folded from the side, via a pull cord, or from the rear, via levers built into the cargo-area sidewalls. There’s lots of stretch-out space in front—front to back and side to side. Rear passengers enjoy adult-size leg room, and the flat floor and wide seat make 3-passenger capacity realistic. Head room is good in both rows, even under the big moonroof. Soft-surface materials abound on the doors, dash, and console. 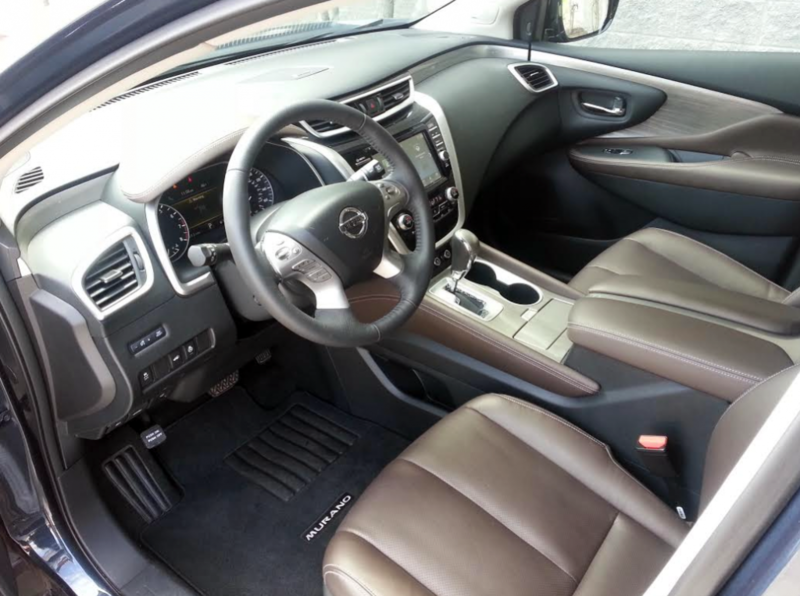 Seats in the Murano tested were 2-tone, and contrast stitching and extensive use of brushed-metal trim on the dash, doors, and console lent some visual interest. 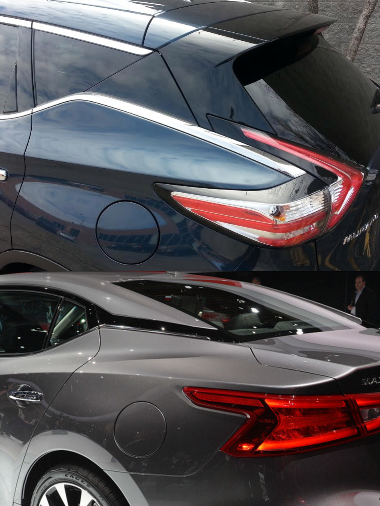 Nissan’s new design theme extends to the redesigned Maxima (bottom), due in show rooms later this year. Among the common elements are a rear-fender “kick up” and “floating” rear roof-pillar treatment. Assembly of the multipart door panels wasn’t the tightest. Ride on the all-independent suspension is a little jiggly. 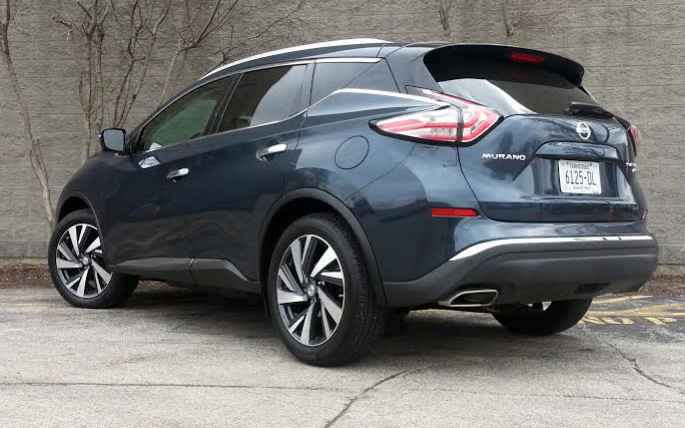 There isn’t the wallowing “rocking-horse” fore-and-aft pitching that afflicts some soft suspensions—the Murano’s ride shows more vertical play, an effect that some drivers might not like. Visibility suffers at the rear corners, where the redesigned roof sinks and revised bodysides rise to crowd out some glass area. Nissan set out to improve the Murano’s fuel mileage for 2015. It was just OK for this driver, who averaged 18.69 mpg from a trip of 116.8 miles, 63 percent of which was under city-style conditions. EPA-estimated city mileage for the new Murano is 21 mpg. Written by: The Daily Drive staff on May 8, 2015.on March 22, 2019.